While researchers often disagree about the relationship between watching violent television programs and aggressive behavior in children, there are enough indicators of a correlation for you to consider limiting your children's TV viewing of violent programming, according to the Media Awareness Network. As a rule, studies show that children exposed to repeated television and video game violence can become desensitized to violence and develop a number of other conditions ranging from aggressive behavior to sleep disturbances and increased anxiety. Media-portrayed violence can expose your kids to the use of violence as a means of settling disputes without consequences.. According to the Parents Television Council, children watch TV more than they participate in any other activity except sleeping. The average American child watches an average of four hours of TV every day and 54 percent of kids have TV sets in their bedrooms, making their viewing habits even more unprotected. Children mimic what they see. If your youngsters watch violent television shows, they are more apt to respond to a perceived attack with the flight-or fight stimulus ingrained in human nature, according to the Media Awareness Network. Additionally, physical changes occur during the viewing. Blood pressure, respiration and heart rate levels rise. Repeated exposure to television violence actually creates a need for increased stimulation over time. Your children can become accustomed to seeing certain acts and if they don't get the same adrenaline rush regularly, they may turn to more intense programming or real life violence for the same physical response. Studies have shown, reports the Media Awareness Network, that kids who watch a steady diet of violent programming have a higher risk of becoming violent in real life as adults. The effects of watching violent television shows has become apparent in a variety of ways, according to the Parents Television Council. In addition to the physical changes children undergo following a viewing of a violent program, children are more likely to disobey their parents and are more at risk of hitting a playmate than their peers who aren't allowed to view the aggressive shows. If you allow your children to become more desensitized to violence over time, they may lose empathy toward others. The violence they see on television desensitizes them to real human pain and suffering and they have difficulty differentiating between entertainment and reality, often developing a tendency to romanticize the villain. Violent images are prevalent in more than the adult-themed shows shown primarily in late evening hours. Cartoons and children's shows feature twice as many violent acts as most regular television programs. What's more, ratings are evolving to allow more violence in PG and PG-13 movies, warns professor Nancy Carlsson-Paige, with the Lesley University in Cambridge. In addition to the negative personality and social effects violent television programming has on children, the act of watching television has other negative consequences. Your kids might not develop healthy empathetic characteristics because they become immune to blood and pain. This desensitization process can lead them to become apathetic to the suffering of others. According to the University of Michigan Health Services, television viewing is a major contributor to childhood obesity and other juvenile health issues. 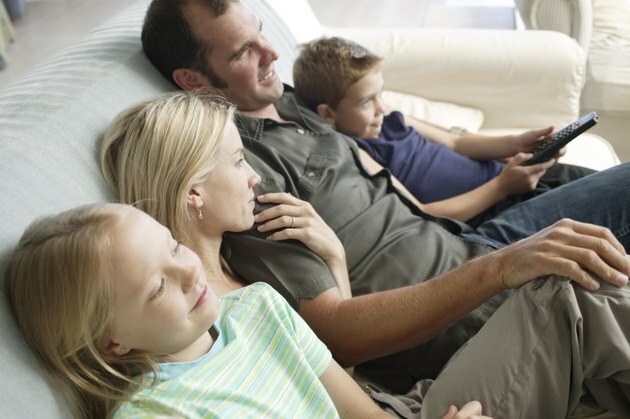 How Much TV Does the Average Child Watch Each Day?